If you do not follow me on Facebook or if you are new to my blog then you might not know that I am participating in The Love Dare that Tausha from Taush.O put together. Everyday for the last 14 days a different blogger has talked about a different aspect of love. There are printables to go with each day and there is a dare for you to accomplish each day. It is our desire to have stronger marriages in our personal lives, but also to all have stronger marriages in our online communities. This movement is based off the the book The Love Dare which is the main prop in the movie Fireproof. I talk about this more in this post. In that same post I direct you to Tausha's blog so you can get the various blogs to visit along with the cute printables. Today is my day to share the dare and the printable to go with it. Day 15 is all about honor. In the book it defines honor as follows, "To honor someone means to give them respect and high esteem, to treat them as being special and of great worth. When you speak to them, you choose your words carefully. You are more courteous and polite. When they speak to you, you give their words valuable weight and significance. You willingly go the extra mile to accommodate them if at all possible, simply out of respect for who they are." I love this. I think we all can safely say that we begin the marriage process by dating our spouse. We honor them...if we didn't then we wouldn't have married each other, right? However, for some strange reason we forget to continue this. I am speaking generally when I say we. Sometimes we treat the ones we love the most the worst. At least at times we do this. I love this dare because it helps us think about our spouse. It helps us think of ways to honor them. Actually that is what I like about the whole Love Dare series. It is a great way to give all of us steps to put our spouses first. If you put your spouse first time after time then your spouse will start doing the same. Well at least that happens most of the time. I do not want to get in trouble by saying it WILL and then it doesn't. But more often than not it affects your spouse positively. I made of list of ways I show my husband that I honor him. Feel free to use some of them. Let him "win" from time to time in disagreements. Forgive him when he upsets me. Ask him how his day is going. If it is bad then ask how I can help make it better. If he doesn't give me an idea then I take matters into my own hand and do something nice. Show love to his family and friends. Be kind to them. Don't give him unrealistic expectations to meet. Make his dreams my dreams. Talk about him to friends, family, and strangers respectfully. Recognize when he does something great. 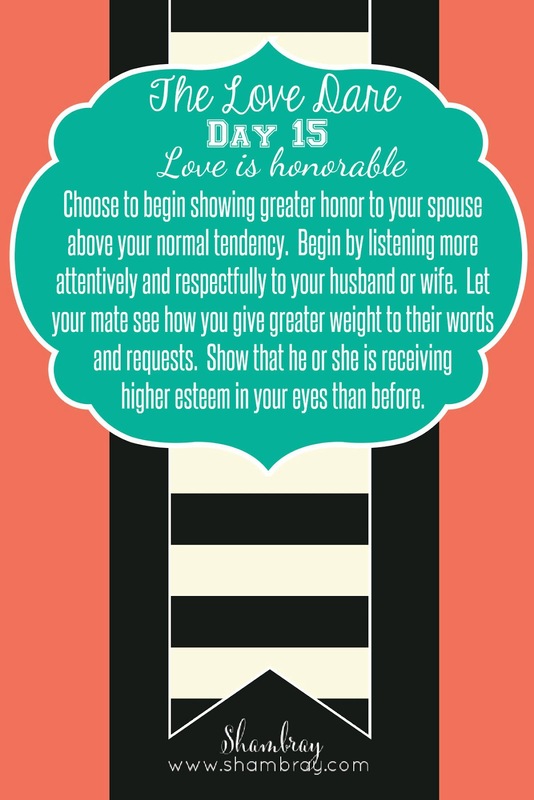 What are ways you honor your spouse?